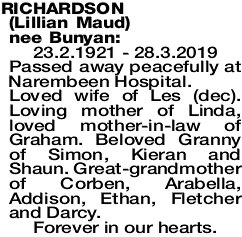 23.2.1921 - 28.3.2019 Passed away peacefully at Narembeen Hospital. Loved wife of Les (dec). Loving mother of Linda, loved mother-in-law of Graham. Beloved Granny of Simon, Kieran and Shaun. Great-grandmother of Corben, Arabella, Addison, Ethan, Fletcher and Darcy.